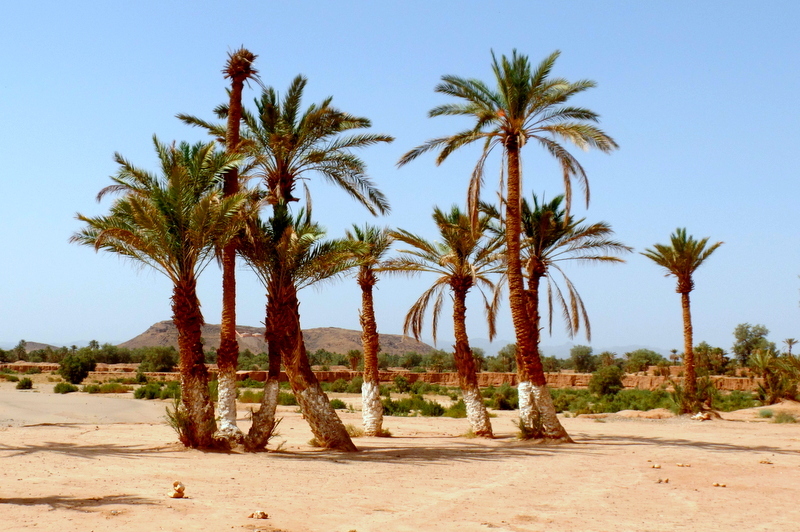 Tomorrow Thomas and I travel to Rabat for 10 days to attend the Peace Corps In-Service Training (IST). The venue we are staying at is right next to the beach, and I am greatly looking forward to being near the ocean. I can’t begin to explain how eager I am to dip my feet in the water, smell the sea air, and to be in a less dry (and less hot) climate for a bit! Ramadan continues to go well, although I am not sure if I will continue to fast during our time in Rabat. My plan is to decide day by day how to structure my meals as I want to be mentally alert during the IST sessions. My mental acuity during Ramadan has definitely shifted into low-gear, and some days the fasting and the heat make it challenging to concentrate on much of anything. Over the last few days I pushed myself to go for a brief bike ride in the morning, as getting out of the house (and getting some physical activity) helps improve my energy level. My first tagine, which I made to mark the start of Ramadan. It had potatoes, zucchini, onions, tomatoes and olives. Our l-ftor for fellow volunteers. I had such a nice time preparing a meal for others. One of the l-ftor meals we enjoyed with Moroccan friends. And I must note that the harira (soup) at this one was especially delicious! While the Ramadan experience has been physically challenging at times, socially we have had a really nice couple of weeks. 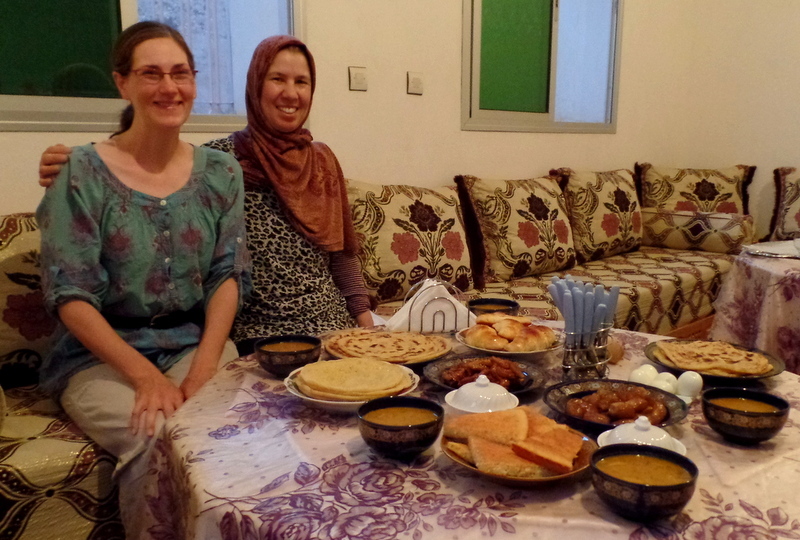 Various Moroccan friends have invited us to break-fast with them, and we have been blessed that each meal included both delicious food and fabulous company. And, we hosted a break-fast meal for several volunteers in our community (a fellow PCV and two women who work for a French organization). It was quite nice to make food for others as part of my Ramadan experience. l-ftor with our friends Malika and Khadija. This is me and Malika just before we started eating. With only 17 hours left before our bus leaves town (we leave at 5:00AM on Friday), I am spending the day getting organized and packed to go. Call me over-eager, I don’t care! As I think I shared in another post, Peace Corps expects new volunteers to remain in their site for the first three months of service. So other than short day trips to nearby towns we have been pretty rooted to our town. I understand how remaining in one’s local community helps establish a consistent presence and fosters integration, but now that this three month travel ban is officially over, I am surprised at how eager I am to leave town for a bit. And I am quite certain that a break from day-to-day life in SE Morocco will give me renewed appreciation for the unique qualities of our community. I took this photo on an early morning bike ride, and while desert palm trees are not the beach, they are still quite beautiful. But I am getting ahead of myself…for the moment I just want to enjoy thinking about a walk on the beach. The beach! Can you believe I will actually be on a beach?! Nice post, Erika, and a lovely photo of you and Malika. Hope you and Tom enjoy your time on the coast. You will actually be on a beach.